Dwarka Bangiya Samaj, like every year, celebrating this year also Shri Shri Durga Puja from 13 th October, 2010 to 17 th October, 2010 and Shri Shri Kali Puja on 5 th November, 2010. During the period various activities like competition on Drawing, Dance, Fancy Dress etc. are being organised. Even artists from Kolkatta and Mumbai are invited for the show. 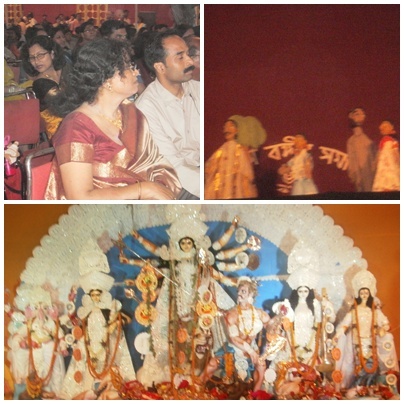 SAREGAMA champs Smita Nandi and Golden age -puppet show were the main attraction. Dr Debabrata Bandyopadhyay, President of Dwarka Bangiya Samaj inform Dwarka Parichay that they have very sincere team of Sh. Sushanta Kr. Sardar, Ah. Santanu Sur, Sh. A K Chanda, Sh. M K Basu, Sh. B B Mondal, Sh. S K Rudra, Sh. Ashim Mondal that helped in organising this Durga Puja also 8 th Year in row.